There are 74 poems in total with the first part having 27 poems and the second part having 47 poems. I must say that each and every poem was unique. Some caught my attention for the meaning, it conveyed. Though these poems were short, the meaning was universal and powerful. And change is the game"
The very next poem to the one mentioned above was "Ups and Downs" in which I liked the last 4 lines, in particular. 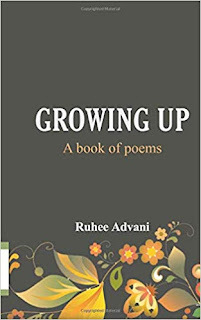 While some poems were real long, Ruhee showed a contrasting difference by penning a 2 line poem(similar to an haiku though Haiku has 17 syllables with three lines of 5, 7 and 5). The poem I am referring to is "Maybe"
Maybe there is a you and me"
This book is available on Amazon in both paperback and ebook format.